The unique, exclusive design which has always distinguished the Group's products is obtained by combining style, creativity and innovation with the quality and craftsmanship typical of Italian-made goods. 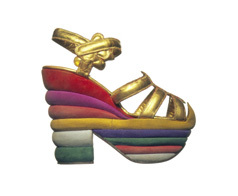 Salvatore Ferragamo products have been made since the 1960s in a select network of workshops. The Group also develops and distributes perfumes under the "Salvatore Ferragamo" and "Emanuel Ungaro" brands, through its subsidiary Ferragamo Parfums. The Ferragamo Group is present through a network of directly operated (DOS) "Salvatore Ferragamo" mono-brand stores (retail channel). The Group also distributes its products through mono-brand third-party operated stores or corners (TPOS), complemented by a prestigious presence in high-level multi-brand department stores and specialty stores (which, as a whole, constitute the wholesale channel). 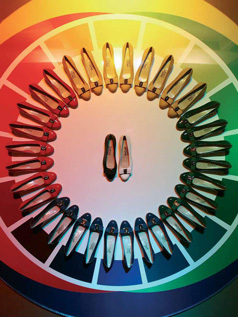 Taking into account the entire distribution structure, the Ferragamo Group is present in over 90 countries all over the world.The primary aim of its distribution strategy is brand control, as it is positioned at the high end of the luxury segment, to uphold the brand’s historical values and always ensure excellent customer service. Salvatore Ferragamo embodies a combination of the longstanding, expert craftsmanship and creative tradition typical of Made in Italy goods. These are the factors of excellence that support this brand, and which have, over the years, evolved in line with its origins. Quality, contemporary elegance and innovation are the hallmarks of each Salvatore Ferragamo product and, together with a tradition of fine craftsmanship, create the value and authenticity for which the brand is universally recognised.The Group is constantly committed to consolidating and developing the value of its brand over time. In line with its historical values, Salvatore Ferragamo upholds high quality standards for its products and distribution processes, by investing in research, product innovation and IT technologies to support its business. Museo Salvatore Ferragamo is a “corporate” museum focussing principally on the history of Ferragamo the company and the life of its founder, Salvatore Ferragamo. Its basic material is therefore the footwear he created, a remarkable blend of invention, aesthetic sensibility and innovative crafting techniques which is a force that’s still driving the Company’s core business today. Opened in May 1995, the museum was established by the Ferragamo family in order to acquaint an international audience with the artistic qualities of Ferragamo and the role the name has played in the history of international fashion, and not only footwear. The “germ” event was an exhibition in Palazzo Strozzi on the history of Salvatore Ferragamo which then went on tour and was hosted by some of the world’s greatest museums, such as the Victoria and Albert in London, the County Museum in Los Angeles, the Guggenheim in New York, the Sogestu Kai Foundation in Tokyo and the Museo de Bellas Artes in Mexico. This temporary exhibition gradually became permanent. Eleven years after opening, its growing success and the need to further dialogue with other local institutions persuaded the family to enlarge the Museum and, on 6th December 2006, it moved to its new premises. In 1999, in recognition of the Museum’s cultural worth and of its endeavours, Salvatore Ferragamo received the PremioGuggenheim Impresa e Cultura, anaward given annually to the companies that have made the most effective investments in culture. 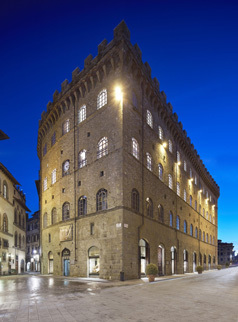 The museum is located in the historical centre of Florence, in Palazzo Spini Ferroni, which is also the Company’s headquarters. The entrance is from Piazza S. Trinita (5r). Salvatore Ferragamo was born in 1898 in Bonito, in the Italian province of Avellino, the eleventh of fourteen children. Passionate about shoes, at the age of eleven, he was apprenticed to a shoe maker in Naples, and by the age of thirteen, he had opened a shop in Bonito. At sixteen, he followed one of his brothers to America, where he worked at a large shoe factory in Boston. Salvatore was fascinated by the modernity of the machines and the production processes, but he could also see the way they posed limits to the quality of the shoes. In the early 1920s, he followed another of his brothers to Santa Barbara, California, where he opened a shoe repair shop. California in those years was the land of the budding movie industry and Salvatore began designing and crafting cowboy boots for Westerns and Roman and Egyptian sandals for the colossal period pieces. It did not take long for the actors and actresses to notice the beauty and comfort of his shoes, and soon they began ordering them to wear off the set as well, while Salvatore, constantly searching for “shoes with the perfect fit”, studied human anatomy, chemical engineering and mathematics at the University of Los Angeles, devoting particular attention to the study of the arch of the foot and research into technical solutions that would ensure better support and balance in a shoe. When the movie industry moved to Hollywood, Salvatore Ferragamo followed. In 1923, he opened the Hollywood Boot Shop and began his career as “shoemaker to the stars”, as the press called him at the time. His loyal customers included celebrities, and his popularity grew. Salvatore was ahead of his time, and he revolutionized the fashion of the times by opening women’s shoes, which until then had been laced and closed. He made them more elegant and more comfortable; he created the first sandals. His success was so great that he could not keep up with orders. However, American craftsmanship was not up to the task of making the kind of shoes he had in mind, and in 1927, Ferragamo decided to return to Italy to open a workshop in Florence, a city with a tradition of expert craftsmen. The years that followed saw the consolidation of his creative and business achievements, with celebrities travelling to Florence to have custom shoes made by Salvatore Ferragamo. 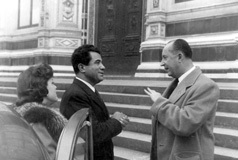 This was when, given his resounding success, he was able to purchase Palazzo Spini Feroni in Via dei Tornabuoni, and it has remained the company’s headquarters since then. 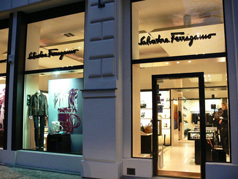 In 1938, in addition to the Florence shop, Ferragamo opened shops on Old Bond Street in London and Via Condotti in Rome. After the war, Salvatore Ferragamo’s shoes became a symbol of Italy around the world through his many inventions, including the steel-reinforced stiletto heel made famous by Marilyn Monroe, the gold sandal and the invisible sandal with an upper made out of fishing line. 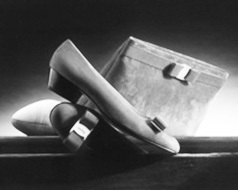 In 1948, Ferragamo opened its first New York store on Park Avenue. In the 1950s, the company had roughly 700 workers who handcrafted a few hundred shoes per day. Over the course of his lifetime, he filed over 300 patents, nearly all of which were in the field of shoes, he paved the way for women’s sandals, invented the cork wedge and developed the stiletto heel reinforced with steel. His immeasurable creativity is demonstrated by the company’s current archives, containing more than 14,000 different styles of women’s shoes. Salvatore’s legacy was left to his wife, Wanda Miletti Ferragamo, when he passed away in 1960. She unexpectedly found herself at the head of the company, with six children (Fiamma, Giovanna, Ferruccio, Fulvia, Leonardo and Massimo) between the ages of seventeen and three. First on her own, and later with the support of her children, Wanda Ferragamo successfully overcame the immense difficulties of the enormously challenging legacy left to her by her husband, and managed to grow the brand’s value, turning it into a genuine label. 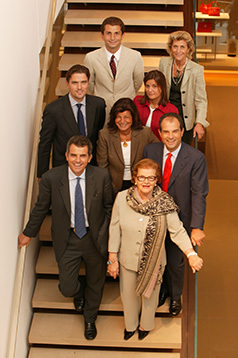 With Wanda Ferragamo and her children, the Group expanded from producing women’s shoes only to creating other products as well, such as men’sand women’s ready-to-wear, leather goods and silk accessories, and the sales distribution network went global with a network of Ferragamo brandstores and relationships with some of the largest, most reputable, multibrand retailers in the industry. Wanda’s dedication, along with that of her children, has transformed the Group into an internationally recognised business with a global presence, through the sound development of a distribution network and the effective diversification of products, while remaining unwaveringly faithful to the values of its founder, Salvatore Ferragamo, and the brand’s signature style, characterised by the quality, fine craftsmanship and creativity typical of Made in Italy goods. At the end of the 1990s, as it underwent rapid development and international expansion, new managers joined the Group to help support its growth. This culminated with the appointment of Michele Norsa as Group CEO in 2006, while Ferruccio Ferragamo and Wanda Ferragamo became Chairmanand Honorary Chairwoman, respectively. 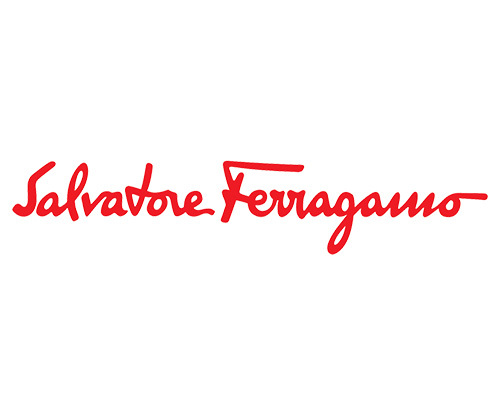 In this new organisational structure, the Salvatore Ferragamo’s descendents act as guarantors of the brand’s values, in part through their position on the company’s board of directors.